A reader sent this. I thought it very apt in today's educational climate. You asked some time ago what else you might be able to make in the workshop for sale. Have you considered bee hives, dehydrators and cooking tongs? The tongs I am referring to are like the ones in this pic from ebay. http://www.ebay.com/itm/Teakwood-Salad-Tongs-and-Serving-Utensils-carved-into-Giraffes-/261451296737?pt=LH_DefaultDomain_0&hash=item3cdfb62fe1 folded one way they are springy and the other way they are flat of storage. I have 2 and I love them. I paid $15 each. They would go nicely with the mugs. I could send more detailed pics of the my tongs. They were offered in different types of wood. We too stood up, spoke out and made ourselves heard. But honestly, that was in a country that no longer exists. America is bleeding out; its spoils are being redistributed. Forcing children to the indoctrination of today's government schools is truly child abuse. We urge today's parents to homeschool. The battleground today is at places such as the Bundy Ranch. Liberty needs boots on the ground. Jefferson was so right about 'the tree of liberty'. Thank you for putting the quote by Einstein in your blog. I was a teacher's aide for three years working with students with learning disabilities and also with students labeled EMR in seventh and eighth grade; most were either sad or angry at being "stupid". None of them were. All were learning, and that's what it's all about. Einstein was a slow learner, a class clown and often a trouble maker, just like the kids I worked with. Thomas Edison was a slow learner. My father was a slow learner, who matured into a brainiac who angered his roommate because he didn't study and still made A's while pursuing a degree in Engineering. My oldest son did not learn to read until he was almost through grade school. He's a fine man now, can read, take tests, and is gainfully employed and supports his stay at home wife and soon to be three daughters. What he did learn while struggling to learn to read was that his teachers thought he wasn't trying, that they thought his parents were not involved and that it was all because he had poor self esteem (which only came about when they made him feel stupid). He was a happy bright child who loved exploring his world and learning how and why of everything, he just wasn't going to get the info from reading a book. Common Core is no more appropriate for ALL students than what my son went through in the public schools. It doesn't even have the support of some of the original people who thought it up, as it's evolved into a way to achieve an agenda rather than educate. Here in NY I know some parents have pulled all of their children out of public school. I know some parents are refusing the testing. This is just in my very small circle though. I'm actually most appalled that even religious education environments are accepting the common core ridiculousness. I do know that homeschooling families are not exempt from the common core at this point. 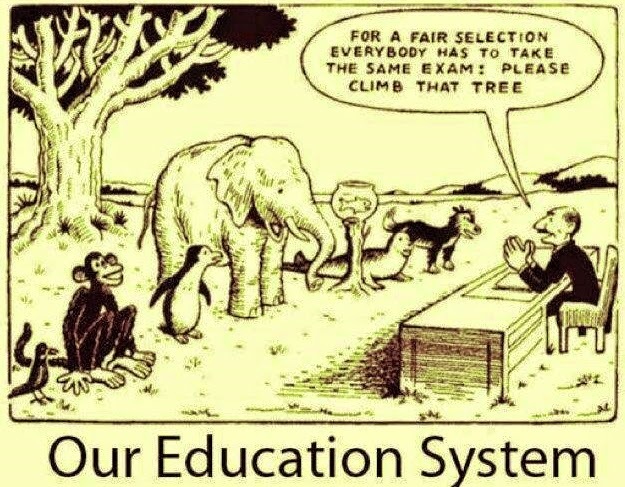 I think the only thing we can do is to fight the system, not subject our children to the testing and/or pull them out. I'm not sure what other course of action there is? Boy does that cartoon nail it! My son went to public school until high school then to a private school. He had low self esteem and was a handful for his teachers but kept rebelling anyway. When he was in the 7th grade he took the ACT college placement test and finished in the top 80% so he was not at all stupid just wanted to read on his own and learn what he wanted to not what they wanted him to. He still reads voraciously and all sorts of stuff so his education is continuing. Reminded me a lot of my self actually. I had trouble clear through most of college until I gave up and played their silly games. At that point I went from a barely passing student to an A student. I still thought a LOT of what I was learning was BS but did what the teachers wanted for the most part. It was really mostly a waste of time and money but it did get me a piece of paper that employers seemed to want. No common core for my two. We homeschool. I have always been thankful that I myself am a "square peg in a round hole" & I have no plans for my kids to become mindless sheep, easily herded either. It's not just Common Core. That's been the problem with the public education system from the word "go." As to what you're doing about it-- I guess you are doing the only thing you can. You took it upon yourselves to give your daughters a quality education. I hate to say so, because it bodes very poorly for the future of kids whose parents just don't care (and there seem to be a lot of them), but I think that's all anyone can do. The problem, unfortunately, seems to be intractable, at least as long as the corporate-controlled government remains bent on trying to use any available means to turn human beings into interchangeable parts. Both my husband and I are teachers. He teaches special education, I am a Social Science (History, Economics, Government, and Geography) teacher. We have been to trainings and let me tell you, teachers hate this garbage too. States are requiring it of public, charter, private, and home schools. Nobody will be exempt if your state has adopted this #@$%. I see a couple of major issues behind all the hype, though nobody with any authority will admit to these. First, this is about dumbing down the content to the lowest achieving students level. It is also about creating a generation who is not well educated so there can be more control. If this were really about high rigor and increased achievement, then the powers that be would have consulted teachers and parents and not governors, textbook companies (who will be making a fortune of of this), and others who have never worked in a classroom. Unfortunately, teachers can't fix the system as we are told what to teach and how to teach it in most cases. Parents need to stand together and demand local control and the right to inspect and give input regarding what their kids are taught. Of course, I am putting myself in danger of not being able to find a job for next year (where I am, teachers get laid off a lot) as the one I have now is a temporary assignment. But, I thought I'd throw my two cents in. Parents, stand and fight.